In 2004, Newsweek printed that, “According to a study conducted by a Boston marketing firm, the average American burns 55 minutes a day–roughly 12 weeks a year–looking for things they know they own but can’t find.” It makes sense that in the last 12 years this number may have changed, given that the average American is more likely to lose electronics and less likely to lose CDs. 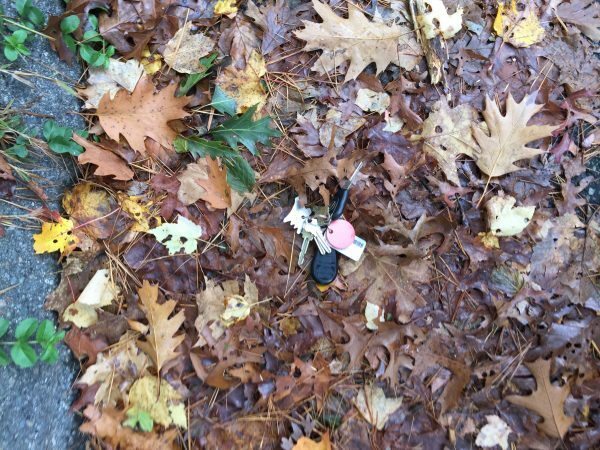 One thing that may not have changed is that people can’t seem to keep track of their keys. 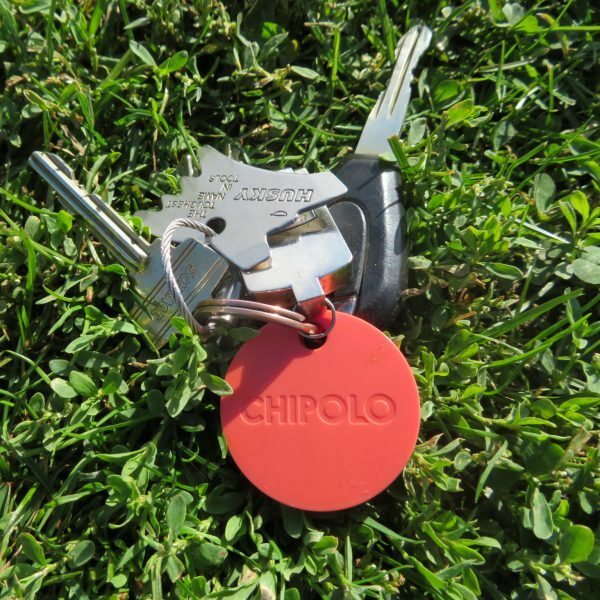 The Chipolo Plus is one among many Bluetooth trackers that address this issue by tethering a small Bluetooth transceiver to a key ring or another device. 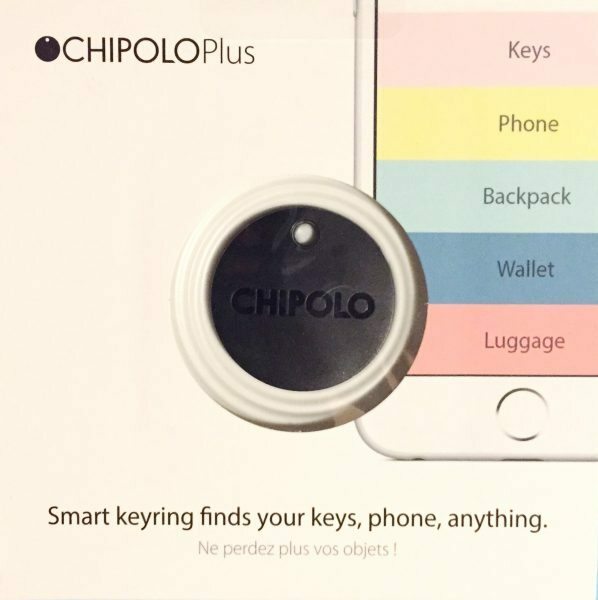 Chipolo has also built features into the technology to make it useful even if you don’t lose your keys. I tried my best to lose my stuff for a couple of weeks. Read on to see what I think. The build quality of the Chipolo Plus is good enough that it didn’t break in the 3 weeks that I carried it around on my key chain. I considered my test typical of normal use; I didn’t subject it to unusual stress or conditions. There is a seam between the top and bottom halves but it seems completely sealed with glue and very resilient. The Chipolo webpage indicates the unit has a liquid ingress protection rating of 5, which means that it can ensure 3 minutes of a 5 psi water jet at 3.3 gpm from a 1/4″ nozzle. There are 3 holes on the backside which I presume lead to the backside of the piezo buzzer. This is a path of water ingress but maybe it only leads to the backside, non-electrical contact side of the device. 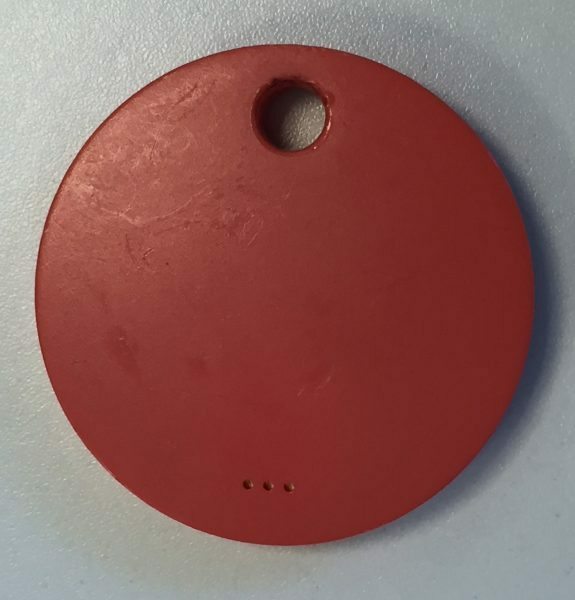 Here’s the back of the device showing the three holes and what it looks like after about 3 weeks on a key ring. Chipolo claims that the Chipolo Plus produces a 90 decible melody. I don’t have a proper sound level meter but I did download an app to measure sound levels. One important consideration is that Chipolo doesn’t provide the testing conditions, including distance, direction, location and environment. This is important since noise level decreases with the inverse square of distance, the direction of the noise will influence the amplitude of the sound, and the environment and location determines if the noise will dissipate or reverberate. The results I obtained are that directly adjacent to the speaker side (rear) of the Chipolo Plus the app shows 108dB peak measurement and 3 feet from the speaker side (rear) of the Chipolo Plus the app measured 77dB peak. The other claim that Chipolo makes is that the device will work with up to a 200ft Bluetooth range. I tried measuring the capabilities of this in several ways. The first test was dropping my keys on the street near a curb and continuing to walk down the street. The Chipolo app on the phone alerted me that I dropped them about 40ft away. The connection between the Chipolo Plus and the iPhone was lost at about 50ft and not regained until I got close to 44ft away. For the next test I dropped the keys on my lawn and walked away. The Bluetooth signal persisted until about 132ft; at that distance I needed to return to about 120ft before I could reestablish a connection and ring the Chipolo Plus. The third test I performed was hanging the keys in a tree about 3 feet from the ground; the Chipolo Plus remained connected for 184ft and could be rung remotely by the Chipolo app from 160ft. At that distance it was also barely audible. The last test I did was dropping my keys outside of my closed garage on my driveway and walking towards the street. I walked 106ft on pavement and another 30ft onto the yard across the street before I lost a connection. I needed to get within 106ft of the Chipolo Plus to ring it from the app. So clearly the surface and location impacts the Bluetooth reception, as well as the presence of adjacent structures. The garage door seemed to improve the signal reception. The app is straight forward on the surface but has some more advanced features that may not be entirely obvious. You’ll need to create a username and password. This will allow you to communicate the location of your Chipolo to the cloud. By going to https://app.Chipolo.net/signin you can view the last known location of the Chipolo. The username and password also enables you to optionally communicate the location of other Chipolos to the cloud. 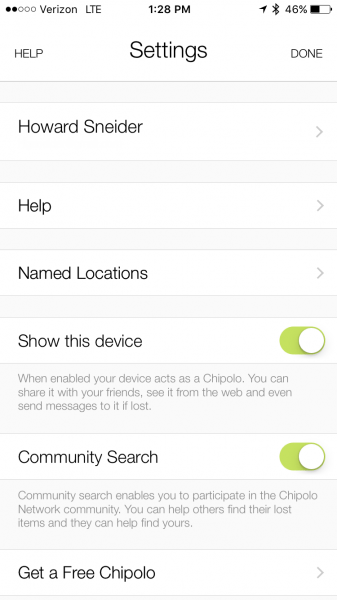 This feature makes it possible for anyone running the Chipolo app to be an access point to locate a lost Chipolo. 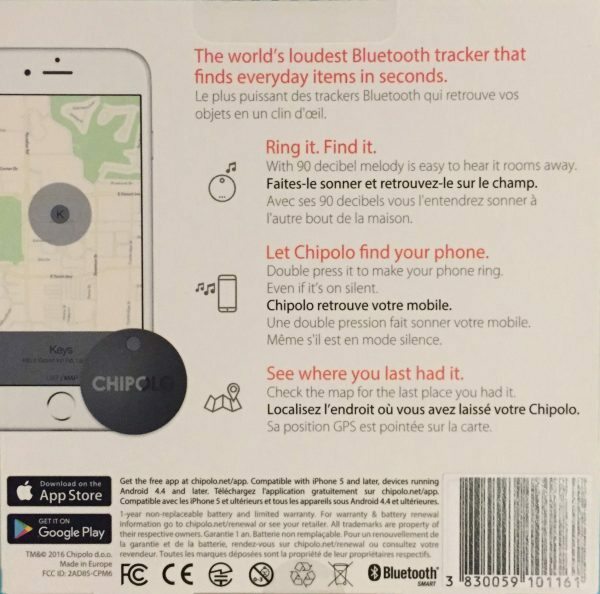 When the lost Chipolo establishes a Bluetooth with any phone running the Chipolo app, the owner will be notified of the approximate location of their lost Bluetooth tag. The app is easy to use. Adding a tag is as simple as pressing it and then moving it next to the phone you are paring it to. Once a connection is formed you can name it. 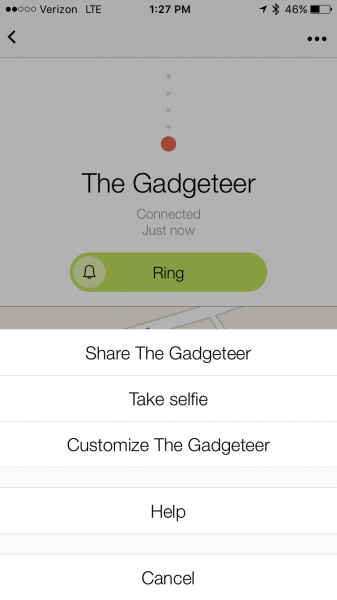 I named mine “The Gadgeteer”. When the setup is complete you will see the main screen below. The color of the Chipolo on this screen and the following screens mimics the color of the tag in real life. A black tag will show up grey, an orange tag will be orange, etc. 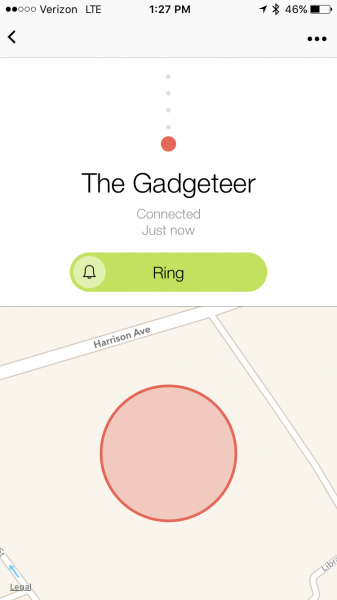 Named Locations: This feature allows you to set a quiet zone so that out of range and in range notifications and alarms are not triggered in the selected region. 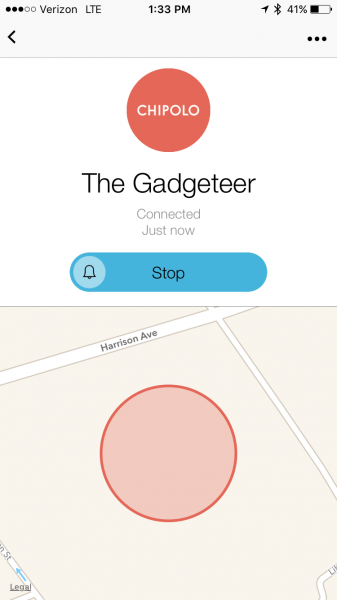 On iOS you can set the quiet zone on a map and on Android you set the quiet zone by binding it to a WiFi SSID. It seems that in the iOS version you can effectively set half the United States as a quiet zone, but you can’t set the zone to be smaller than a 50m radius. Also, the Android version includes structures on the map but the iOS version does not. 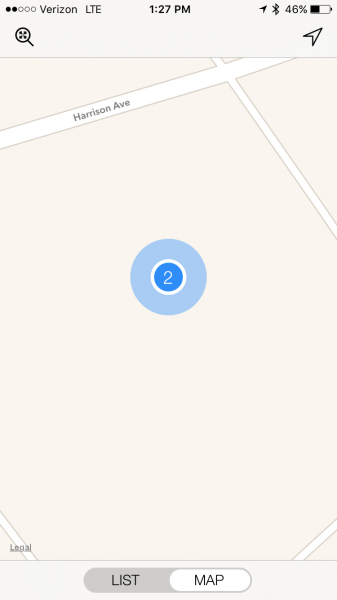 This is counter intuitive since the iOS version allows you to relocate the named location, so that you can center it on a home, for instance, but the Android version does not. I found that the out of range and in range notifications can be a nuisance if, for instance, you leave your keys in a known place in your house but have your phone away from the keys. Setting up the named location is a practical necessity if you are going to follow this regimen. Community search: As described above this is the feature which allows you to participate in a community of Chipolo users who use their devices as sentinels for lost Chipolos and notify the rightful owner of the lost Chipolo’s location. If you choose not to participate in finding other Chipolos then you lose the benefit of potentially having other users locate your device. “Get a Free Chipolo (GFC)” program: Until Christmas 2016, if 3 people buy Chipolos using your coupon code then you will qualify for a free Chipolo tag. As a benefit, the people who use your code get 20% off the purchase price of their device. From the main screen you can also toggle the switch at the bottom to view the location of the tracked items on a full-screen map. Note that there is an option, one that I have selected, to show the iPhone on the map as well. This is useful to demonstrate on screen the relative position of the phone to the last known position of the tag. Android phones also have an option to enable a beta background connect feature. Clicking on the tag name will bring you to a screen that shows a preview map of the location and the name of the tag. A green button in the center of the screen may be pressed to activate the tag’s alarm. If you press the green button it turns blue to let you know you should be listening for the alarm. Pressing the button again will stop the ringing. I didn’t find any documentation on this, but if you press the Chipolo icon at the top of the screen it turns into a Bluetooth signal meter for the tag. In the picture below you can see the red dot all the way at the bottom of 5 grey dots. This means that the signal is strong. When the signal is weak the red dot is shown at the top. If you think of it as a range indicator then the signal is weakest when the red dot is farthest away from you and the signal is strongest when the red dot is close. The rangefinder feature is included by default on an Android screen. From the ellipsis at the top right of the screen you can select other options. The displayed menu is shown below. Sharing the Chipolo allows two people to track one tag. However, only one device may be bound to the Chipolo at a time. This is useful if two people each have their own Chipolos and also want to share one. Take selfie allows a squeeze of the Chipolo to act as a remote trigger for the phone camera. Customize [Chipolo name] opens the screen below. 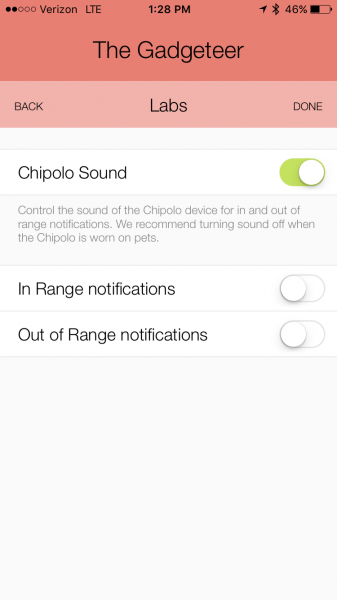 This last screen enables or disables the sounds produced by the Chipolo. There is a lot of competition in the Bluetooth tag sector. To be the best requires a small, sturdy device that lives up to its claims and has a host of features and customization. The Chipolo Plus has just about all fronts covered. It is a small, inexpensive, maintenance-free device that is unobtrusive enough so that you may forget that it is there, but is designed to be a real life-saver when you need it most. One of the Chipolo tags that I was sent for my review a year ago died a month prematurely; I only had it in my possession for 11 months before it was no longer operable. It seems that from my experience and others who have commented on the original story that the stated life expectancy of these units may be overstated. The other tag I have has a low battery warning on the phone, but if I didn’t happen to check the app, I would never know how low the battery is. An alert stating that the battery is low would be helpful, although, in all fairness, I may have missed the alert if there is one. In any case, since a dead battery won’t help finds a missing set of keys, a Chipolo with a low battery is too risky to be carrying around. Source: The sample for this review was provided by Chipolo. Please visit their website for more info and check their Amazon page to order. You didn’t mention that the Chipolo only lasts one year before you have to upgrade it. Looked like such a good idea I bought 4. Arrived quickly, with very nice package. To bad that’s where it stops. Two of them had their battery die within the month. Their sound can be heard from 15 feet away, as long as nothing is covering them and it is quite around you. I attached one to the TV remote, and put one in my wife’s wallet. She lost her wallet the next week (with the orange Chipolo in it) and we have not been able to locate it yet. Its not like she had gone very far, she had an operation on Monday and so was not going anywhere. So with one lost and two with dead batteries I think I’ll put the last one on my dog. Bought a pack of 4 from them direct. Got them fast but thats about where the good ended. Paired to my Samsung S7Edge and pressed the app to find my Chipolo. If you can hear it from 3 feet you are doing great. Dont expect to find your keys anytime soon it is so soft. Then I tried pressing the Chipolo to find my phone….even worse….just a little chirp and then a message that its ready to be found. 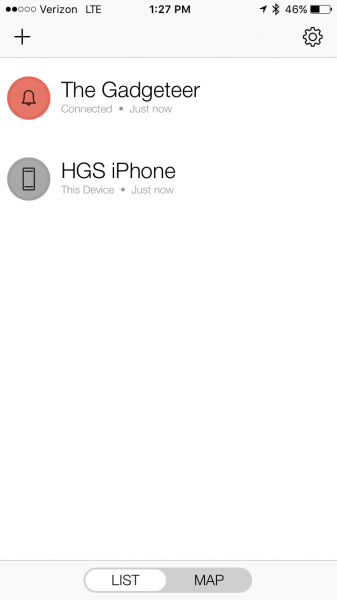 You will never find your phone with this device. Then tried contacting them via chat online and was finally told nothing was wrong with the Chipolo and if I wanted a refund….would have to send back to Slovinia with a tracking number. Dont waste your money on this tracker.